When I learned to make a distinction between religion and spirituality, I was able to open myself to the great forces/energies at work in our worlds. With the help of many I have learned the importance of breathing and staying grounded and connected to the earth. Of being anchored to my core self and being authentic in my voice and practice. I’ve learned about the power of intention and the importance of working with allies – seen and unseen. These are powerful tools and practices when one is in the midst of struggle – especially conflict with the State. I have learned to trust my instincts and my intuition and am training my eye to better see the dynamics of power in any given situation. I have watched again and again, in the midst of heated protest, the pull of spirit and the hunger of so many people to be connected to themselves and each other and to the energy we generate together in the streets. When we are in the midst of all that power, energy and chi we are most fully alive. People are desperate to feel alive. 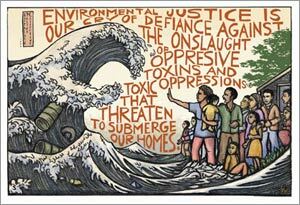 Over the years and through the protests, my primary collective – ACT, the Alliance of Community Trainers, has been weaving together magic, activism and ecological sustainability. We have been learning and working and incorporating permaculture, natural design and bioremediation it into our resistance and liberaton work. Whether it be greywater filter handwash stations in Cancun, to a mobile toliet in Miami, to toxic clean up in Brunswick, GA and in New Orleans, to composting toliets in Scotland, Texas and California. We are promoting sustainabile systems and practices that pre-figure the a world we desire. Below are some resources and groups we work with. Permaculture is a worldwide movement for sustainable design. It was founded in the late 1970s by two Australians: Bill Mollison and David Holmgren. The cornerstone of permaculture design is observing and mimicking patterns found in nature. People often arrive at permaculture through an interest in gardening. And certainly, growing food where people live is an essential component of creating a more sustainable society. But permaculture isn’t a gardening system per se, and it isn’t (necessarily) about growing your own food or living out in the country. In fact, the worldwide permaculture movement is as much about co-designing more sustainable cities, towns, villages, neighborhoods, workplaces, professions, companies, schools, economic arrangements, financial institutions, and social organizations as it is about making our agricultural practices more sustainable. Permaculture design draws on natural patterns to create human systems that are healthier and more productive. Using this design approach, human beings can actually have a positive impact on the land and on all other species (as opposed to merely reducing our negative impact). Ever feel hopeless about all the bad news you hear, and powerless to address the problems of the world? Study and practice permaculture. You’ll come to know that making positive change is much easier and closer to home than you think. A permaculture design course consists of classroom instruction, field trips, hands-on projects, and a site design project. Intensive courses include rustic accommodation (camping or other simple arrangements), supplementary evening programs (videos, guest speakers, etc. ), and communal meals.